The next time you are in the Museum, check out the kneeling bench, now on display in the 14th-15th century gallery. Part of ongoing experiments with seating, this kneeling bench offers a way to experience the spiritual dimension of art in this gallery. 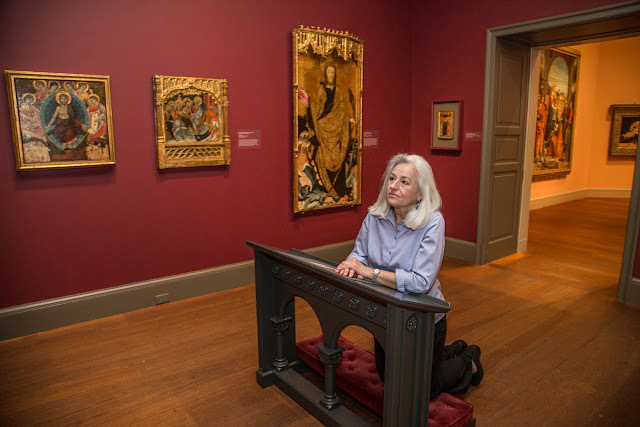 The kneeling bench was loaned to the museum by the United Congregational Church, UCC. It dates from the early twentieth century and was used by couples kneeling for a blessing at the end of their wedding ceremony. The kneeler is similar to a traditional prie dieu, which is used for personal prayer and devotions. We invite you to try the kneeler yourself to experience how viewers/worshipers in centuries past may have experienced this powerful art.